By now you have probably started to see poetry ideas pop up all over in your social media news feeds and on Pinterest. It can only mean one thing: National Poetry Month is here. I loved teaching poetry, and for the most part, my students always loved our poetry unit. And -although I'm sharing this post with you in April (National Poetry Month), I want to encourage you to teach poetry all year long. You don't have to wait until Spring each year to bust out your poetry books - in fact - you shouldn't! Poetry is the perfect genre for teaching reading, writing, and speaking skills and strategies in a short period of time. 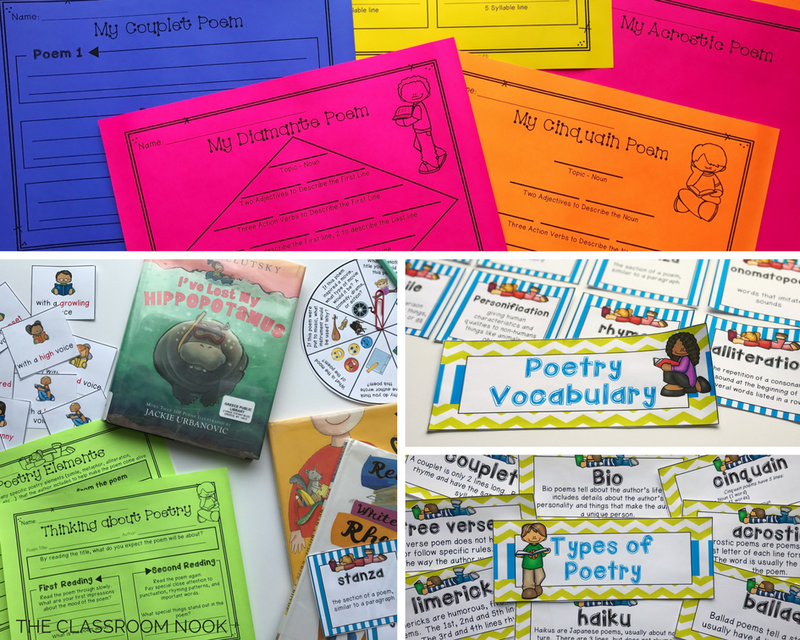 Since poems are short, incorporating them into your lessons lends itself to a quick bite-sized lesson on skills like fluency, literature analysis, reading comprehension strategies, and more. Students need practice with fluency all the time, but having them recite the same lines of text over and over loses its flare and meaning. Why not try poetry voices. 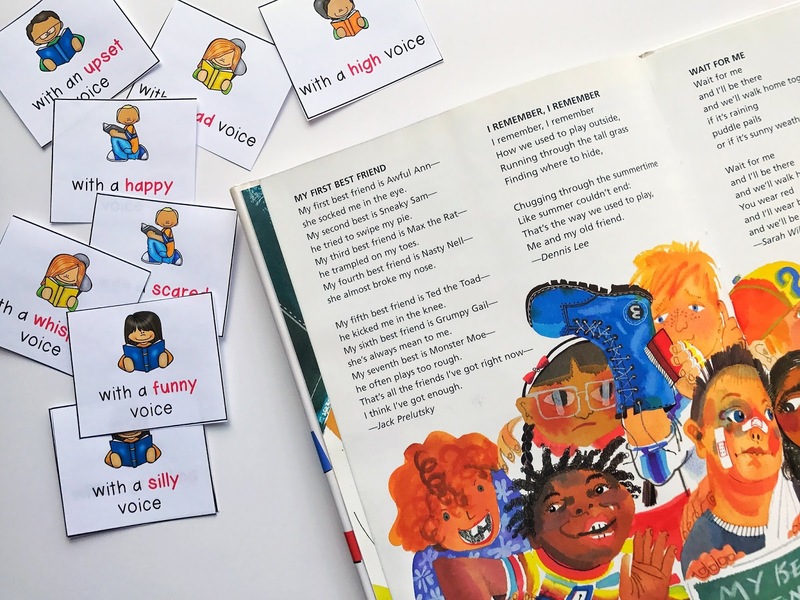 With this simple activity, students choose a poem and a poetry voice card and read their poem with the type of voice indicated on the card. Then, they can choose another card, and another, and...you get the point. Each time they read the poem in a different voice, their fluency improves...and they are having fun! This activity can also lend itself to a good discussion on choosing the right voice to convey the mood of the poem. Poetry makes for great discussion! 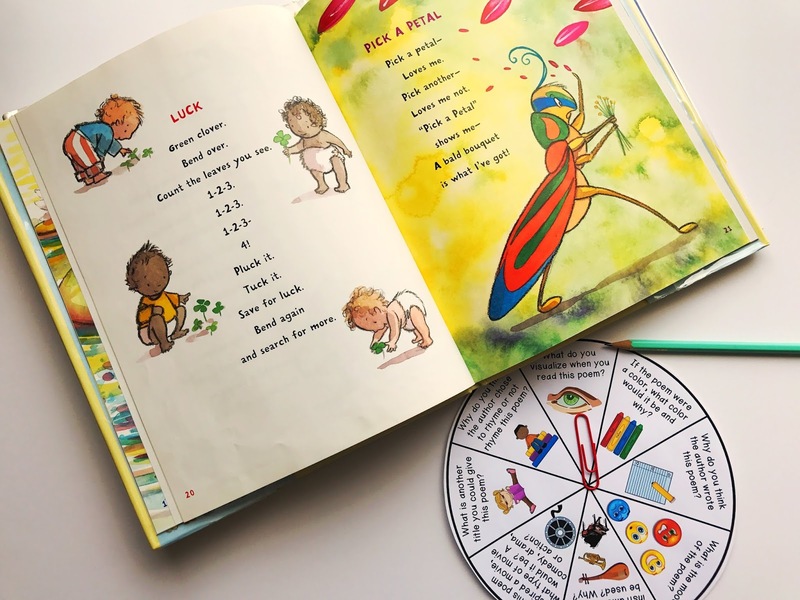 Whenever I was in need of a quick center during my reader's workshop, I would gather some poetry books and include a poetry discussion spinner and let the students read the poems together and then spin the discussion spinner to talk about the poem. It's easy to keep this center fresh, simply by adding different books to the center, or even switching up the prompts on the spinner. Sometimes I would just use a generic spinner (like shown below), and other times I would create a spinner that included prompts that covered specific skills or strategies we were working on in class. For example, if we were working on making connections, I could include prompts on the spinner that would help guide the students to have discussions on making connections with the poems they were reading. 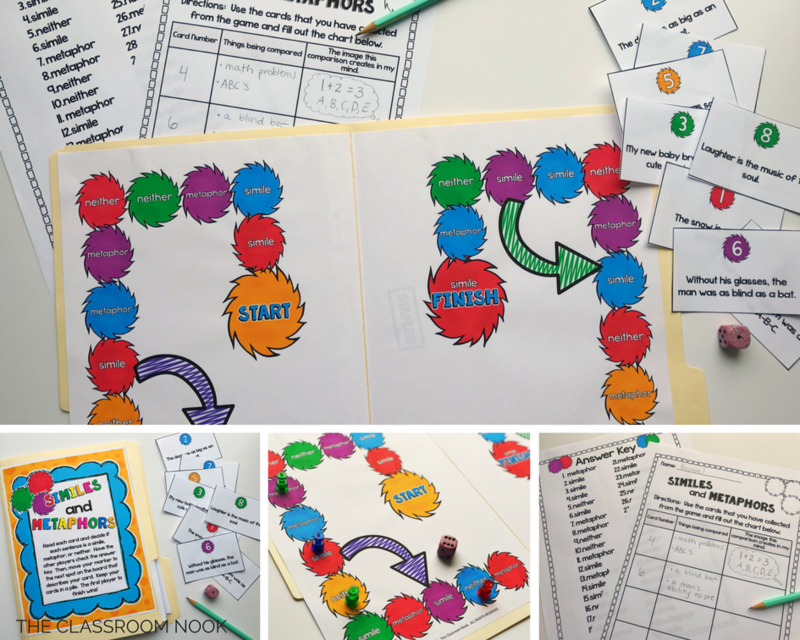 Another fun way to help students refine their poetry skills is to have them play some games. I've got 2 for you that you can snag for FREE. The first game helps students to identify poetry elements such as onomatopoeia, alliteration, personification, and others. It's called Pockets of Poetry and it's simple! Students read a card that illustrates a poetry element, and students place it into the correct pocket and write their card number on their recording sheet. The second game helps students to identify the difference between similes and metaphors. On this cute game board, students choose a card that has a simile or a metaphor on it - OR neither, and decide which one it is. Then, they move their game piece to the next spot on the board that represents their answer. One last online game activity that I think would be a big hit with your students is magnetic poetry. Kids can play on any digital device and play with "magnetic letters" to create fun poems. They simply drag letters from the word bank over to blank area and create their poem! Students have the option to click on "more words" to refresh their word bank. There's a "Kids Magnetic Poetry Kit" as well as a "Nature Magnetic Poetry Kit" that could also be fun for your students! Either one would make a great literacy center if you have access to a small-group set of digital devices. Your reading and writing lessons shouldn't get all the fun! Who says you can't use poems in science, social studies, and math, too! Poetry makes for great response activities. Have your students write a poem in response to what they learned in your lesson. For example, when my students were learning about the American Revolution, one of my lessons included students writing an acrostic poem using the word "LIBERTY." Students could also write bio poems for famous people that they are learning about, haiku poems when you're learning about biomes or animals in science, and so on! Did someone say digital learning guide? If you know me as of late, you know I am allll over the digital learning guides. You can even learn how to make them yourself by signing up for this FREE video training series. In fact, I can't stop creating them. My latest request: a poetry digital learning guide! And here it is friends, in all it's glory! Pop this guide into your literacy center anytime of the year and you'll have your students reading, writing, and understanding poetry in an interactive, self-paced way. Students use the guide to complete a flipbook where they recording important information about poetry types and poetry elements, tips for reading poetry, and even trying their own hand at it. So fun! You can see all the details here.